Bonsai means “plantings in tray”. It is derived from two words. The first is “bon” which translates to a tray or low-sided pot. The second is “sai” which means a planting or plantings. As you realize, bonsai is a Japanese art form using miniature trees grown in low-sided containers. The purpose of bonsai is primarily aesthetic. The miniature trees are visually pleasing. Also, the grower receives the added benefit of the “pleasant exercise of effort and ingenuity”. By contrast with other growing, bonsai is not intended for the production of food, medicine, yard-size gardens or landscapes. 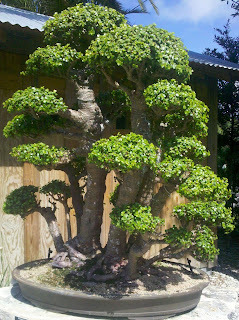 Instead, bonsai focuses on long-term cultivation and shaping of one or more small trees growing in a container. A bonsai is created beginning with a specimen of source material. This may be a cutting, seedling, or small tree. 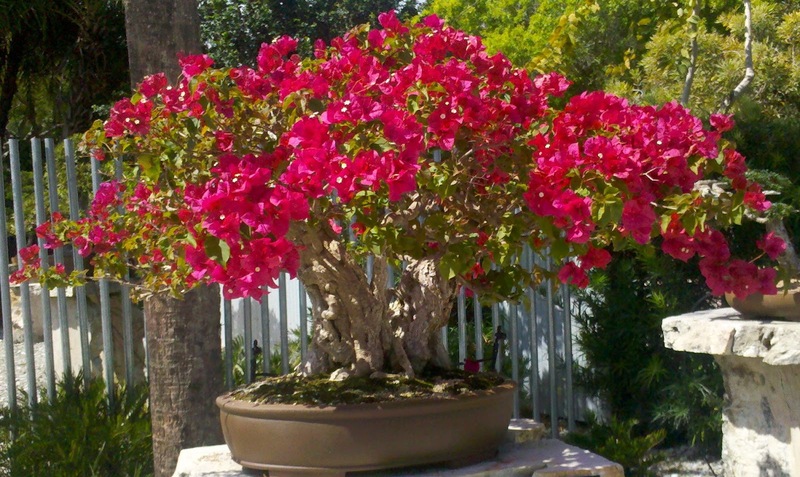 Bonsai can be created from nearly any perennial woody-stemmed tree or shrub. The tree must produce true branches that can be cultivated to remain small. Pot confinement is maintained by crown and root pruning. Some plant species are popular as bonsai material because they have small leaves or needles that make them appropriate for the compact visual scope of bonsai. Bonsai in Japan dates back to 603 A.D. when diplomatic missions were sent to mainland China. Japanese embassy personnel and Japanese Buddhist students returned to Japan with many souvenirs, including the occasional container planting. Bonsai is also evident in ancient Japanese hand painted scrolls. The earliest known scroll to depict dwarfed potted trees in Japan is the Saigyo Monogatari Emaki scroll which was painted in 1195 A.D. In addition, during the 14th century, Chinese Chan Buddhist monks visited Japan to teach at Japan's monasteries. One of the monks' activities was to introduce Japan’s political leaders to the art of miniature landscapes as ideal accomplishments for men of taste and learning! Fast forward to the present. Today, the availability of specialized bonsai plant stock, soil components, tools, pots, and other accessory items is widespread. Bonsai nurseries in Japan advertise and ship specimen bonsai worldwide. Most countries have local nurseries providing plant stock. Potters around the globe provide material to hobbyists and specialists in many countries. More than 1,200 books on bonsai in at least 26 languages are available in over 90 countries. There are at least 100,000 enthusiasts in some 1,500 worldwide clubs. Now you know! So my message this week is to use the art of bonsai as a metaphor for building healthy relationships. Relationships need daily tender care and feeding. In a healthy relationship, the “grower” gets the benefit of “pleasant exercise of effort and ingenuity”. My point is that relationships need effort and ingenuity! And, as with bonsai, relationships need patience. Sadly, our societal culture is predicated by the hour. Schools, sporting events and television all run by the almighty hour. However, the essence of a relationship is not managed by the clock. Relationships require patient bonsai-type skills. To learn some bonsai relationship skills, visit my website at www.AmericasMindsetMechanic.com. Happy cultivating and pruning!